The EE2-12NU is a Miniature Signal Relay with DPDT silver alloy with gold alloy overlay contacts, non-latching coil, standard lead type and solder surface-mount terminals. 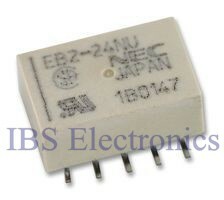 This EE2-series relay features compact, thin and lightweight. Low power consumption and sustaining high-performance.